A testimony of faith and discipline – BGen Tyne Bañas, BGen Reuben Basiao and BGen Ezra James Enriquez are inspiring a generation of Centralian military servicemen. 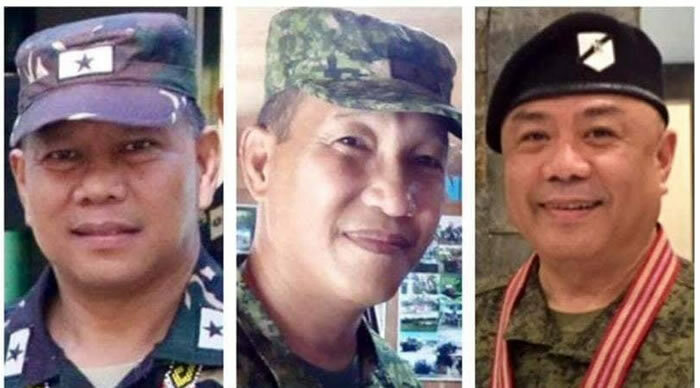 Pastors Kids and CPU High School Batch 1981 Alumni, Tyne Bañas, Reuben Basiao and Ezra James Enriquez have been promoted to Brigadier General by President Rodrigo Roa Duterte. Basiao and Bañas were promoted on 2017 while Enriquez was promoted on 2019. BGen Basiao took up his Kindergarten, Elementary and High School Education at Central Philippine University. He thereafter pursued Chemical Engineering in the same university but stopped on his 2nd year to pursue his love for military service. During his stay in the Philippine Military Academy, he became the Class Baron. He graduated in 1988. In January 20, 2017, then Col. Basiao assumed leadership of the Philippine Army’s 701st Brigade from Brigadier General Bienvenido R. Datuin Jr., the change of command was held at the 701st Brigade Headquarters in the City of Mati. He also served as the Philippine Defense and Armed Forces Attaché in Thailand. Known as a man of peace and prayer, BGen Basiao has carried the Centralian spirit of camaraderie and faith. He is the son of the late Rev. Melecio T. Basiao, former Head of the CPU Religion and Ethics Department, Mrs. Esther S. Basiao, a long time University Registrar of CPU. BGen Basiao has made the Centralian community proud. On the other hand, BGen Bañas is one of three sons of a former CPU teacher – Rev. Prudencio Bañas. He studied at CPU Kindergarten School in 1977 and finished his High School in CPU in 1981. He spent 2 years in Mechanical Engineering in CPU before he was admitted to the Philippine Military Academy. He graduated in the PMA class of 1987 and was deployed to several assignments before becoming a Brigade Commander at Camp Agaab in Sarangani Province, Camp Evangelista in Cagayan de Oro City. He also served as an Army Officer in General Santos City for 18 years. He attributes part of his military success to the ROTC training he underwent in CPU – where he imbibed Christian values and integrity; two important pillars in living a Christian life. Bañas recalled the knowledge he earned from spiritual convocations and Sunday Schools in CPU. He would share these to his officers and men; encouraging them to do it on regular basis. Love, friendship and generosity are important ingredients in his career as military officer. His group has volunteered in extending humanitarian missions to Panay Islands, especially during disasters and calamities. These, he considers as Christian missions. About the Central Spirit, Bañas believes that it’s there when there is something in common, “I often observe in times when other people learn that I am a Centralian. Anywhere they go, Centralians are accommodated and welcomed”, he added. Asked what he could extend to the CPU ROTC Unit in view of the decrease in enrolment brought about by a new military curriculum, he suggests that there has to be more exposure to the cadets in terms of advocacy programs and information dissemination. He would like to include the cadets in a complimentary study program which he is going to prepare for the CPU ROTC Unit. B.Gen Tyne Bañas is presently based in Fort Bonifacio, Metro Manila with his family. His 3 sons TJ, RJ and EJ are all professionals, and one of them following the military footsteps of their father. On March 4, 2019, Pres. Duterte promoted Ezra James Palomero Enriquez, (CAV) MNSA to the rank of Brigadier General effective March 4, 2019. BGen Enriquez is currently the Commander of the 2nd Mechanized Infantry Brigade, Mechanized Infantry Division, Philippine Army, based in Lanao del Norte. He hails from Cateel, Davao Oriental and Badiangan, Iloilo, and is a graduate of the Philippine Military Academy Class of 1988. He is a graduate of the Central Philippine University Development High School (CPUDHS) batch 1981. He is happily married to Deneel Pulido-Enriquez, his classmate in the CPUDHS ’81 and AB English ’86 of the CPU College of Arts and Sciences. Deneel is the youngest daughter of Dr. Agustin A. Pulido, former President of CPU from 1971 to 1996 and former President of Silliman University, and Dr. Dorothy Bermejo-Pulido, former director of the Iloilo Mission Hospital. He served as the Chief of Staff of the United Nations Disengagement Observer Force (UNDOF) and was the National Contingent Commander of the 7th Philippine Contigent to the Golan Heights in the Israel-Syria border in 2014. He was also directly involved during the Marawi Crisis in 2017, serving as the Task Group Commander and Deputy Commander of Task Group Bakal, providing armor support to the Philippine Army units fighting the Maute-ISIS. BGen Enriquez had undergone the following military courses: Basic Airborne Course (1988), Special Operations Team Training (1988), Air Intelligence Officer Course (1993), Armor Officer Basic (1994) and Advance (1999) Courses, Command and Staff Course (2005) at the Australian Command and Staff College. He is a trained pilot and a Private Pilot License holder. BGen Enriquez is a recipient of 2 Distinguished Service Star awards, about 60 military medals, badges and ribbons and about 50 Letters of Commendation for his combat and administrative accomplishments and achievements. His latest Distinguished Service Star was conferred to him by former President Benigno Simeon Cojuangco Aquino III last October 1, 2014 in Malacañang Palace for his outstanding service rendered in the UN Peacekeeping Mission in the Golan Heights. He was also a recipient of the Order of Lapu-Lapu (Kamagi) Medal which was personally awarded by President Rodrigo Roa Duterte on the occasion of the 12th Activation Anniversary of the Mechanized Infantry Division last September 20, 2018. The award is for his outstanding participation in the successful liberation of Marawi from the Maute-ISIS elements.